Fennel is a valuable asset for our health especially in winter when the variety of vegetables decreases. The risotto that I propose was invented when I had a craving for rice and little time to make it. 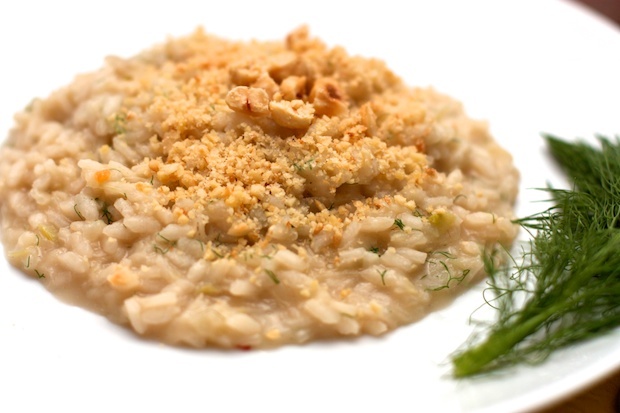 I thought I’d add toasted hazelnuts that with their caloric intake can transform a risotto with vegetables into a main dish. This preparation amazed my family who found it unusual but very delicious. Bring 4 cups of the water to a boil in a sauce pot. Grate the onion and fennel with a grater with large holes. Keep the fennel fronds (fennel leaves close to the white bulb). Add to a saucepan with three tablespoons of water and a bit of salt. Let simmer for about 10 minutes. Add the rice, stir with a wooden spoon and allow to simmer until the rice is dry. Pour in half the wine, let it evaporate, stirring constantly, then add the remaining wine and broth granules. Cook the rice for about 20 minutes, adding water from time to time. The rice should get soft but not soupy. Turn off the heat, add the butter and cheese, fennel fronds, chopped fennel and let sit for two minutes. Roughly chop the hazelnuts. Place the rice in individual dishes, place one hand on each plate of nuts. Serve immediately while still hot.